Who said Ray of frost was bad? This seems nuts right? Return of Burn Mage. OK, RNG means you're not always going to get what you want but still a very powerful card. This seems really good. Especially with that cheap mage Twinspell. I can totally see running this, all the cheap spells and gadgetzan in some sort of aggro or burn deck. Cheaper mini Lyra (although you have to casts the spells first the cheaper costs lets you cast more spells), you can run 2 of these bad boys. A very strong tool for quest mage, I think that 2 of these clouds can complete the quest by themselves. Wow! That's really strong. It makes spell spamming very productive. It is still RNG but getting back your hand with stuff isn't bad, right? Value/Control mage getting some love. This makes Ray of Frost better. Even though this card doesn't seen to be a turn 2 play, I see so many 2/2s in this set that playing a 2/3 en turn 2 will be great for tempo. Elemental Evocation + this on turn 1? If you play elemental evocation you can play it on turn one and get a 2/2 on the board plus a spell. If you have the coin you get two spells and can ping. It's something, for sure. That's a synergy, but it's not worth it on turn 1, since you basically replacing Evocations, spells that you put in your deck with some random spells, most likely some crappy ones. 5/5 or better in stats on turn 1 in exchange for one card is not worth it? Lemme introduce you to a little friend of mine called Tempo. 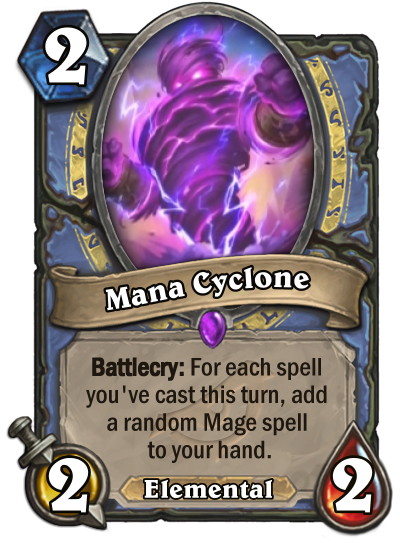 Seems good, but I am a little bit tired of all random spell- or minioncreation cards.